Track length: 300m | Opening times: 1100 - 2000h Mon - Fri, 0900 - 2100h Sat, 1000 - 1900h Sun. York Motor Sport Village is an ideal indoor go karting track for drivers in the York area with a comprehensive range of events. The circuit has a number of different race formats for small to large groups and can cater for stag/hen parties, corporate groups as well as junior parties from the age of four. Head southeast on College St toward Deangate then turn left on to Goodramgate. Continue on to Monkgate and at the roundabout take the third exit on to Heworth Green/A1036. Continue to follow A1036 and Go through one roundabout and at the next roundabout take the second exit on to Jockey Lane, go through one roundabout then turn left on to Kathryn Ave then turn right. For groups of 5 or more adult drivers: 10-laps qualifying plus a 20-lap race. For groups of 5 or more junior drivers: 10-laps qualifying plus a 20-lap race. A 40-lap practice session for adults and juniors on track together. For groups of 5 or more drivers: 10-laps qualifying plus a 30-lap race. Not available for under 16 year olds on Saturday's. A variation on the Monza that allows drivers to compete in 3 timed qualifying heats of 10 laps each. This time points are awarded for the best lap times in each heat. . At the end of the heats all drivers compete in a 12 lap semi-final, decided by first past the post. The top drivers from the semi-finals then race in a 12 lap final. For up to 6 children using the Kub karts aged between 4 and 7 years old. After a short introduction taking around 5 minutes, your party will have the rest of the time to drive around the track in small groups, changing drivers at frequent intervals. For up to 12 children using the Kub karts aged between 4 and 7 years old. 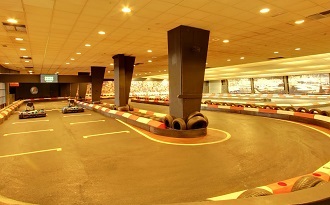 There will be up to 4 karts on track together and after a short introduction taking around 5 minutes, your party will have the rest of the time to drive around the track in small groups, changing drivers at frequent intervals.